We have had many debates in this country about education budgets and teacher pay. Let's be honest. It is not a pretty picture. Actually, it is uglier than I really thought it was. The following infographic compares the amount of time teachers put into their job and the salary they get out of it. In the US, our teachers work more than teachers in other countries while receiving very little. Take a look for yourself. For the record, Finland ranks first in the world in education. Every budget comes out demanding more money be cut from education. In some districts, teachers are taking pay cuts from salaries, supplements, and benefits while being asked to teach more classes with ever more students in the room. Some teachers have not seen a pay raise in 3 years, even in the form of cost of living increases. Something bad is happening. If our leaders don't recognize the importance of education and paying teachers as an investment for the future, then they will be paying for jails and welfare for a long time to come. GraphJam.com features several types of graphs relating to pop culture. They are usually quite funny, and surprisingly accurate. Here is one for you. As you can see, for the first few months you don't wear pants. When your mother dresses you, your waistband reaches quite high and steadily drops until your mid-20's. 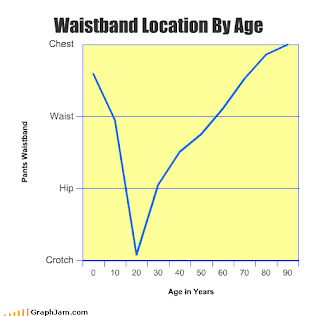 About 25-26, you decide that having your pants so low is actually very stupid looking and waistband height over compensates traveling to the chest region.